Miso is one of those super versatile ingredients that I find myself using more and more. Miso is like Pink. Not pink the color, but Pink the artist. It seems like she’s never in the spotlight, drama-wise, at least, but in the last ten years, she’s had countless hit songs. I’m not a Pink fan, but somehow when I hear her songs, they kind of sound sort of familiar. Miso is just that like that — in the background, but always lurking, always familiar and always delicious. I think of miso paste as super ubiquitous, but I actually did have a hard time finding it once. It was when we were living in Palm Springs. I asked at Ralph’s (the major grocery store chain) and the clerk asked her manager, but they only had instant miso soup — not exactly what I was looking for, but a good try. What I learned: if you’re looking for miso paste and you live somewhere with a lack of Asian grocery stores or Whole Foods, head to your local health food store, they usually have a pretty good selection. It’s totally worth it to seek out and buy a tub of miso paste. It stays good for quite some time in the fridge and it’s for so much more than just soup! Here, I stirred some into oil and rice vinegar for a quick salad dressing with a umami-filled kick. 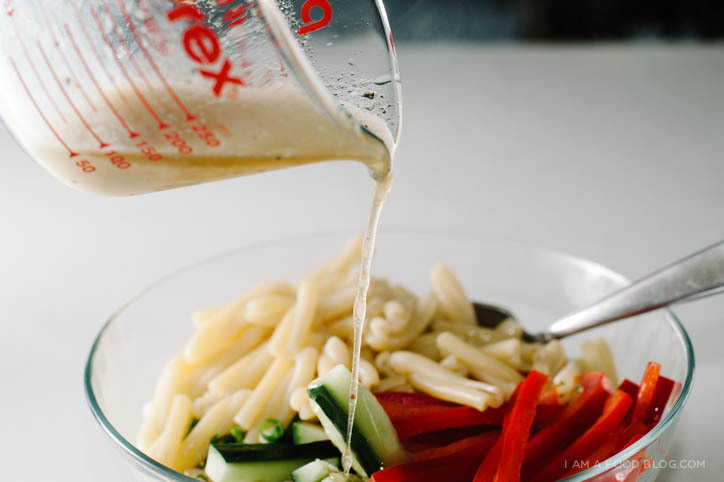 In a small bowl, whisk together the miso dressing ingredients. Taste and season with pepper. Cook your pasta according the package instructions. Drain and set aside to cool. 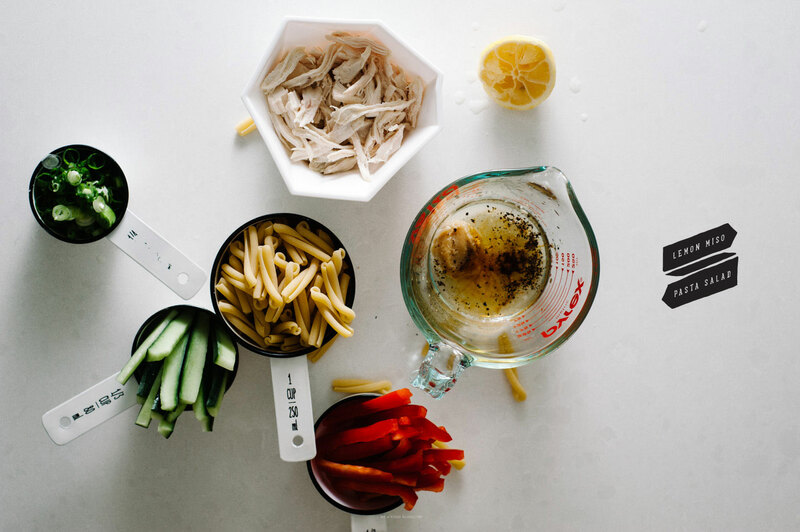 In a large bowl, mix together the pasta, peppers and cucumbers. Add the miso dressing a bit at a time, tossing and tasting. 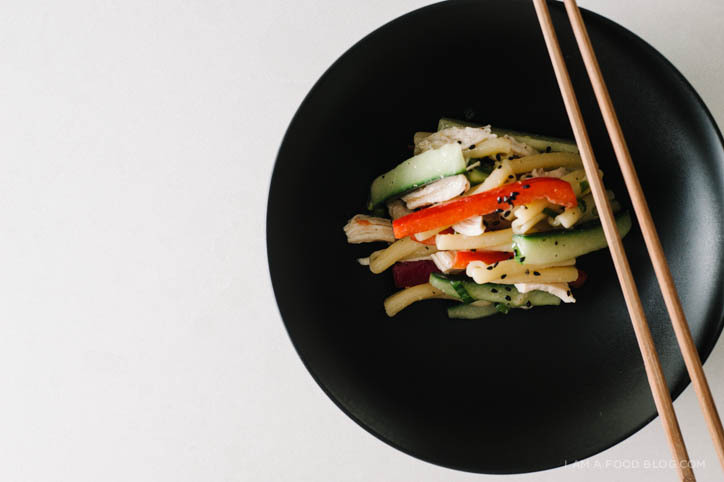 Top with green onions and sesame seeds and enjoy! Must try! I love miso+pasta! Do you think tofu could be used instead of chicken? it’s officially time to invest in miso paste. Åh det där måste jag prova! 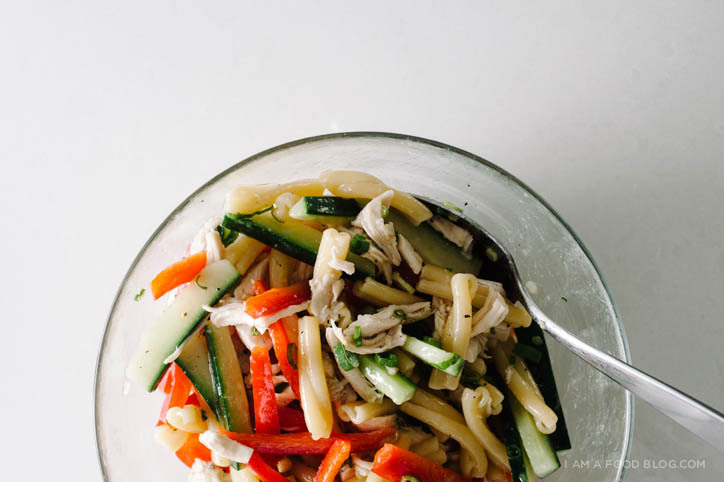 I’m a sucker for miso and this pasta salad is definitely calling me. Looks lovely! Yay, another way to use miso! I’ll be making this. Thanks again for the recipe, Steph. This is a very good combination! Very nice way to combine miso and salad! This is one I definitely have to try! 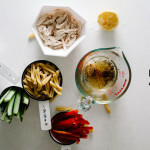 (And indulge on some noodles with) I came over here from momofuku for 2 and I LOVE your new blog! Thanks so much Meredith! And yes, I think this dressing would be fabulous on a noodle salad! This is a quick, easy, and delicious recipe, perfect for a last minute lunch! It’s also very versatile– I subbed zucchini for cucumber, and didn’t have any rice wine vinegar on hand so I used balsamic instead. The end result turned out fantastically delicious, even with my changes. Highly recommend this! Oh man, this is amazing recipe. I made it two ways, your way for myself and blended with silken tofu and mixed steamed veggies for my Crohn’s person. I made a large portion of your dressing, going to use it on a slaw.